Armagh Cathedral can lay claim to the oldest choral tradition in Ireland. In the ninth century, a branch of the Céilí Dé, or ‘Culdees’, ‘the Companions of God’, came to Armagh. A religious brotherhood, originally from Tallaght near Dublin, they established themselves in a priory near the Cathedral. The Culdees were committed to a rigorous asceticism, but were also devoted to preserving standards of worship, including the use of choral music. 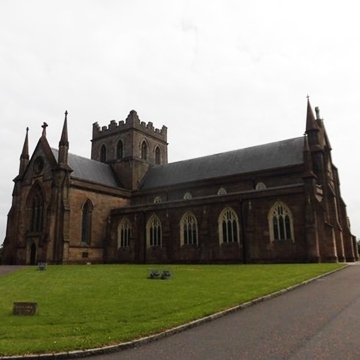 When a network of dioceses was established in Ireland in the early eleventh century, and the bishops of Armagh adopted the title of archbishop, the church at Armagh became more clearly a cathedral. The Culdees remained as its choir, or ‘Vicars Choral’, until the sixteenth century. In 1482 the Cathedral had the first of its seven organs. The present instrument was built by J. W. Walker & Sons in 1840. It has been restored and enlarged on a number of occasions, most recently in 1996 when it was given a new resonance and flexibility of range and tone.